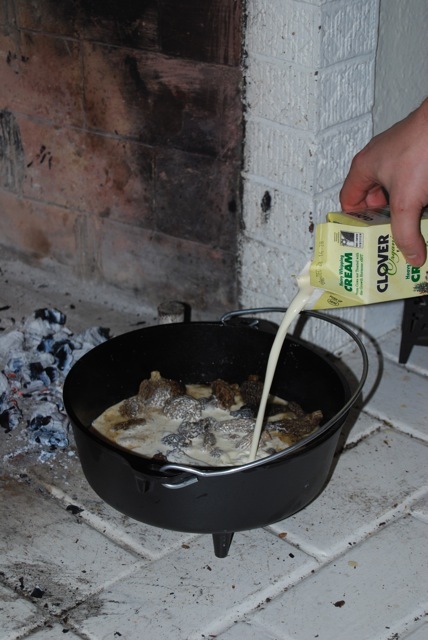 This is a great dutch oven recipe which I recently cooked in my fireplace! It is a classic recipe of Chicken with Vin Jaune and Morel Mushrooms with a creamy wine sauce. 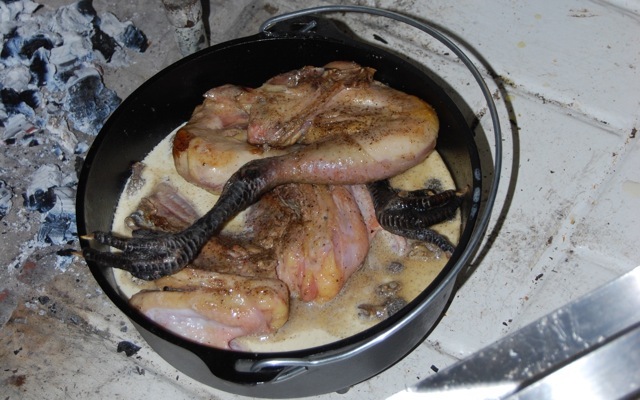 In a sense, this is a variety of Coq au Vin that is classic to the Jura region in eastern France. There they make the wine with their most famous wine from the region, Vin Jaune, which is aged in barrels for over 6 years and has a unique oxidized, nutty, spiced and rich aroma and flavor. 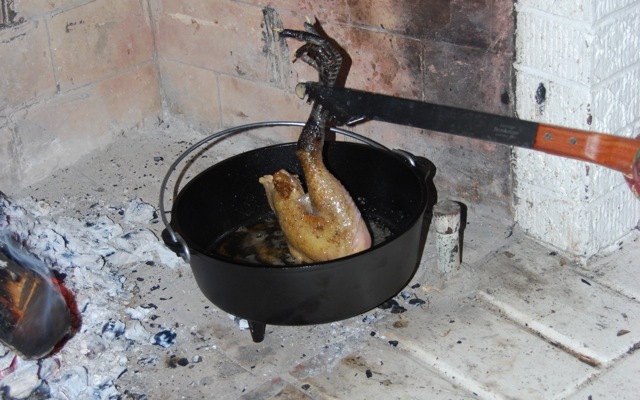 Traditionally, the local chicken, famous the world over, called Poulet de Bresse is used. 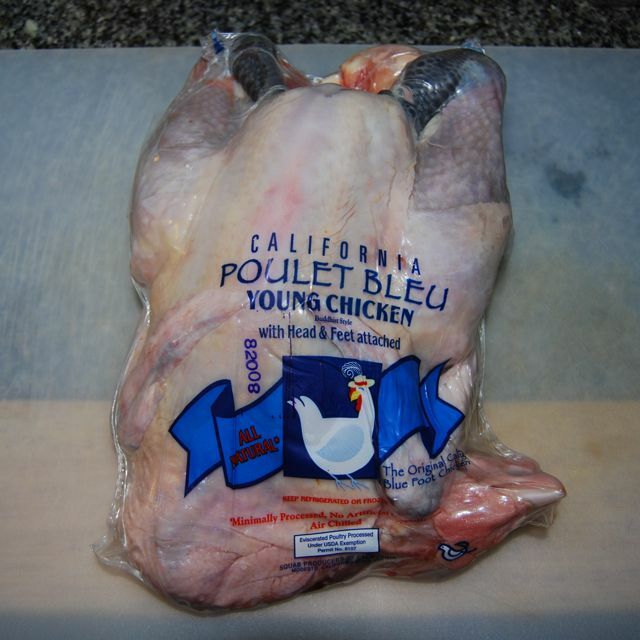 This breed of blue foot chicken can't be imported to the US but a few farmers raise the breed here, known here as California Blue Foot Chicken. I sourced one of these outstanding chickens for this wonderful dish and dutch oven recipe. While this dutch oven recipe could just as easily be made in a large pot or dutch oven on the stovetop, I find it much more rustic and romantic to cook it in the fireplace. 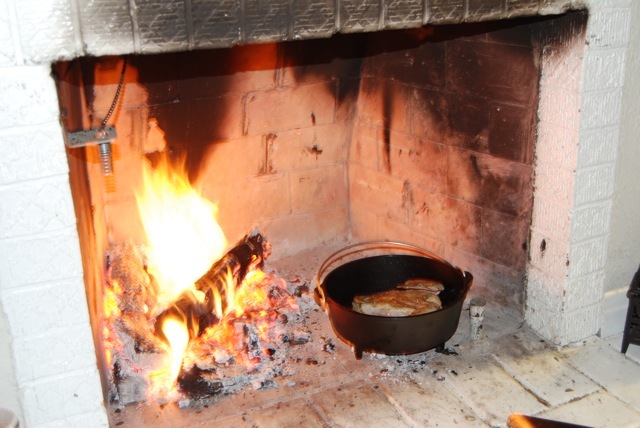 Fireplace cooking and dutch oven cooking go hand in hand in my opinion and whether you do it hanging from a fireplace crane or sitting in the hearth in a campfire dutch oven over hot embers (as pictured below) it can turn out great! You could also do it outside on a firepit, in a campfire or anywhere else you can heat your big, heavy pot. I served this dutch oven recipe with a risotto made with a stock made from the chicken giblets, neck and back, wine and mushroom juice. It turned out beautifully! Safety Note! 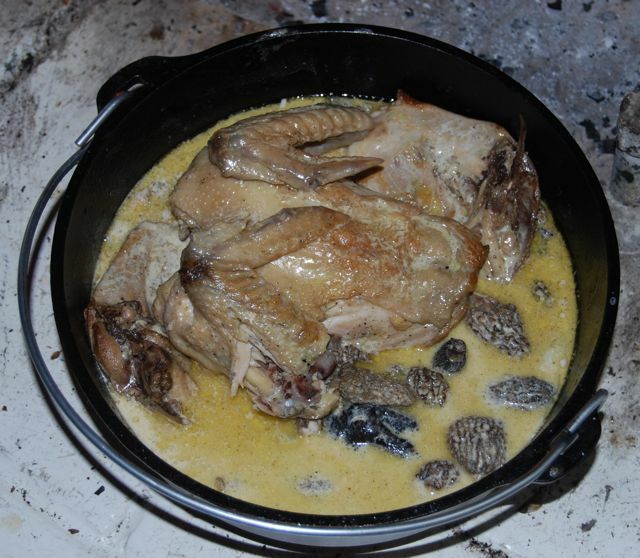 - If cooking this dutch oven recipe in your fireplace or over an open fire, be careful! Use fireproof mittens and long utensils (tongs, spatula, etc.) to cook the food to avoid burning yourself or getting fire or embers near any flammable materials! A Dutch Oven: If you are doing this on your stovetop, any heavy, large pot with a tight-fitting lid will do. 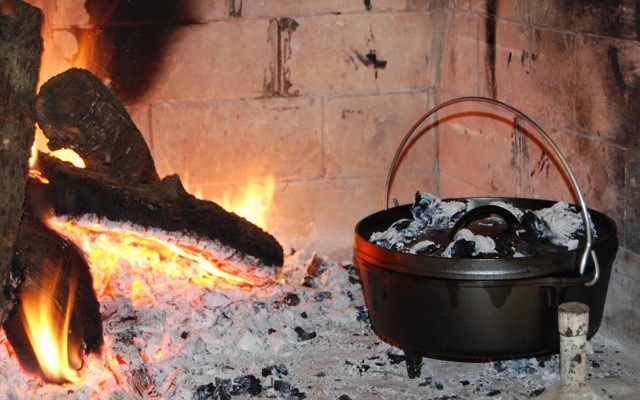 If you want to do it over a fire, you'll need a pot such as a cast iron dutch oven as seen in the pictures below. You can either hang the pot by its handle over the fire (from a campfire tripod or fireplace crane) or if it has feet you can sit it over hot embers or coals. 3/4 pounds fresh morel mushrooms or 3 oz dried morels: There really is no substitute for Morels in this recipe but they do tend to be expensive. However, if you want to you can use other types of fresh or dried mushrooms. 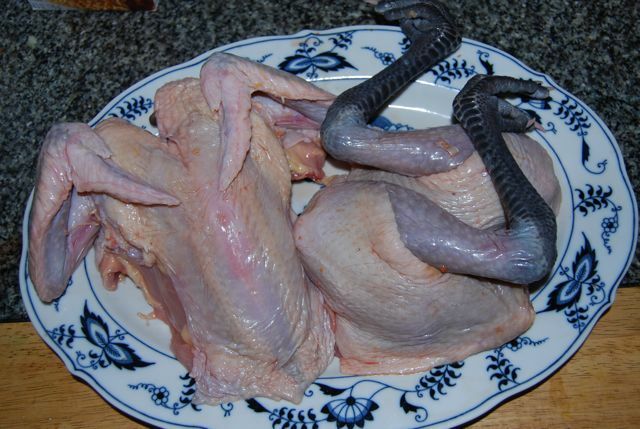 One whole chicken cut up: Ideally, find a blue foot chicken or poulet de Bresse. If you can't find these, you can still make this with any regular chicken around 3 to 4 pounds. A pheasant or guinea hen could work well too. 1 cup Vin Jaune: If you can't find Vin Jaune or don't want to spend the money, you can substitute other white Jura wines such as Cotes de Jura, Arbois Blanc, Savagnin or l'Etoile. If you can't even find these, you could substitute a Fino or Amontillado Sherry. Failing all these, try any richly flavored dry white wine. lemon juice: To taste, but the juice from one medium sized lemon should about do the trick. Take out your chicken and let it come to room temperature. If whole, cut it up into several pieces so that it will be easier to sauté and will all fit nicely in your dutch oven. Reserve the giblets, backbone, neck and head if available. If you are using dried mushrooms for this dutch oven recipe, put them in a large bowl and pour over hot water, just enough to cover the mushrooms, and let sit for 15 to 20 minutes until soft. Drain the mushrooms on a paper towel and reserve the soaking liquid. Pour it through a paper towel to filter and set aside. If you would like to make a risotto or just want to make a nice chicken stock for later, put the chicken giblets, neck, backbone, head and any other extra parts in a large pot. Add salt, a few black peppercorns, a bay leaf and a chopped onion, cover with water and bring to a boil. Simmer gently with the lid slightly ajar for at least an hour. Strain, taste and adjust seasoning with salt and pepper and set aside. Get a fire started early. As pictured below, I started a small fire in one corner of my fireplace to leave room for the dutch oven to sit on the other side. You will place your oven over just some hot embers, not the whole fire. Once you have some nice hot embers forming at the base of your fire, use a heavy tongs to place some embers on the bottom of your fireplace, away from the heart of the fire. 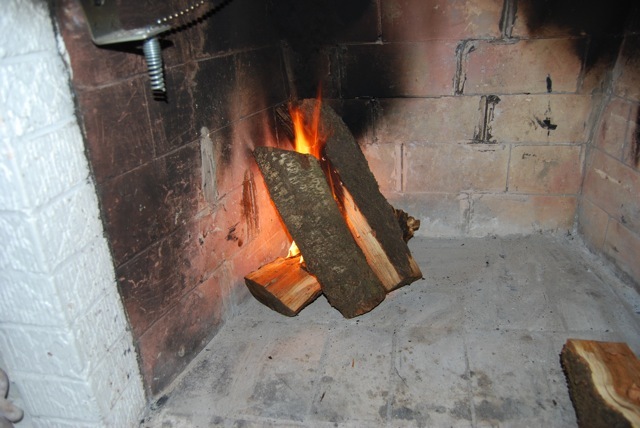 Keep adding wood to the fire through the cooking process to keep additional embers coming. Place the dutch oven over a few hot embers and let it heat up. If you have a campfire dutch oven, you can add several hot coals on to the top of the lid for more even heating. Add olive oil and butter to the pot. Season the chicken pieces well with salt and pepper on all surfaces. When the oil is hot, add the pieces of chicken and brown them briefly. Turn until all sides have a nice golden brown appearance. If you need to, you can do this in batches. When done, remove all the chicken pieces to a plate or bowl and set aside for now. Deglaze the pot with the wine and scrape up any bits that may be stuck to the bottom of the pot. Then add the mushrooms along with a tablespoon or so of the reserved soaking liquid. Let this come to a light boil and reduce by about half its volume. Slowly stir in the heavy cream, adjust the seasoning with some additional salt if needed and add back the browned chicken pieces to the pot. Reduce the heat to low and cover the pot. To do this, it may be necessary to remove a few of the hot embers under the dutch oven. Throughout the cooking process for this dutch oven recipe you may need to occasionally check and adjust the heat by adding or removing embers from below the pot or on top of the lid. Occasionally stir and flip the chicken to cook evenly. In this manner you should cook this dutch oven recipe chicken for about 45 minutes, depending on the size of your chicken and the heat of the fire. The liquid should simmer during cooking, never reaching a heavy boil. When done, remove from heat and stir in the lemon juice to taste and adjust the seasoning with additional salt if necessary. Some people add another splash of wine at this point too. Serve chicken with morels and cream sauce spooned over with rice and big glasses of Jura wine (ideally Vin Jaune) and enjoy! Note on Risotto: I served this with risotto that was delicious. I started with about 2 cups of arborio rice which I sauteed briefly in a large pan with butter. 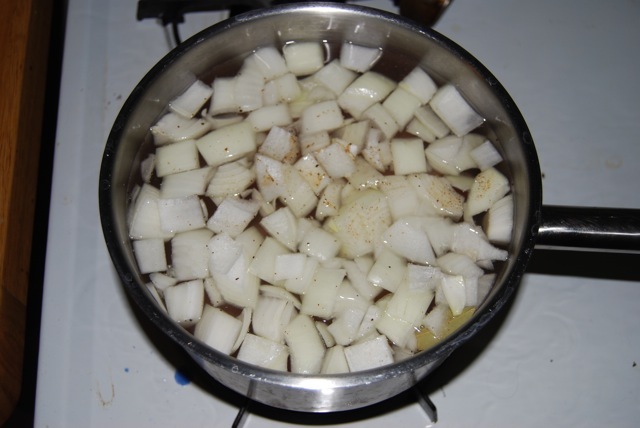 I then slowly added ladle-fulls of the chicken stock I made from the giblets and chicken pieces. I also used the rest of the mushroom soaking liquid and another cup or so of wine. Continue stirring over low to medium heat while occasionally adding more liquid each time it dries up. After the rice gets soft, taste occasionally and keep cooking and adding liquid until the risotto is the desired soft consistency. Adjust seasoning with additional salt if needed. Enjoy! I hope you like this dutch oven recipe! Done with this Dutch Oven Recipe? Or go to the Grill Recipes page. Or go to the Campfire Cooking page.